ASSOCIATION OF RAISED LOW DENSITY LIPOPROTEIN LEVELS WITH VARIOUS RISK FACTORS OF ISCHEMIC STROKE AT A TERTIARY CARE HOSPITAL. Shahzad Alam Khan Nishtar Medical University, Multan. 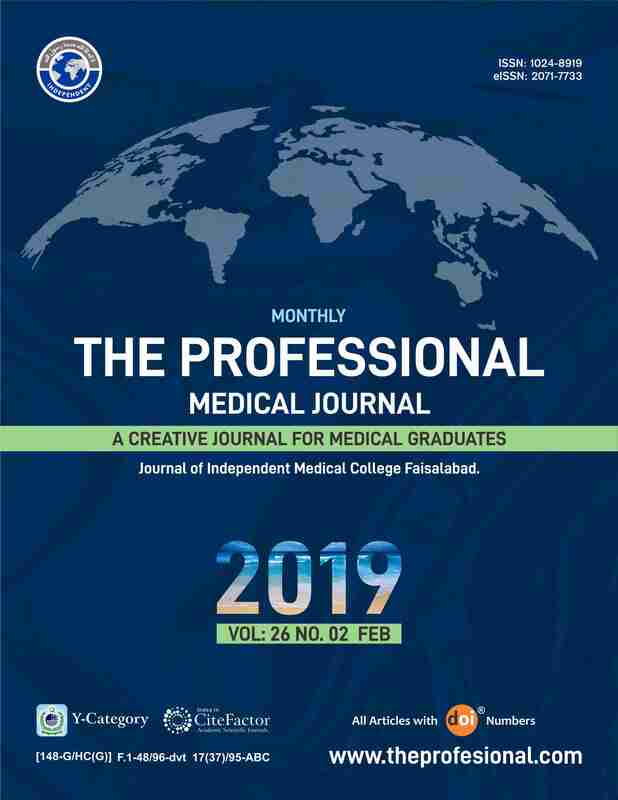 Nasir Jamal Khan Nishtar Medical University, Multan. Ikram Fareed Langrial CPEIC Multan. Objectives: To establish the association of raised LDL levels withvarious risk factors causing cerebral ischemia in stroke patients. Background: Cerebrovascular accident (CVA) is a health concern worldwide. Itcauses enormous disabilities in adult age group, and is 2ndcommonest cause of deaths throughout the world. It has been established thatapproximately 15 million people succumb to stroke each year worldwide, out of this 5 million don’t survive and another 5 million become permanently handicapped and thus put significant burden on catering families. This study was conducted to identify contribution of different risk factorsin causing ischemic stroke in our population. Study Design: Descriptive, purposive case series study. Setting: Medical Unit-IV, Nishtar Medical College/Hospital, Multan. Period: One Year tenure spread between January 2017 to December 2017. Material and Methods: 205 cases between 40-70 years of age includingboth male and female patients with ischemic stroke, irrespective of disease duration were included in study. History of raised BP, previous stroke, history of stroke in family, diabetes and smoking was recorded on pre-designed questionnaire. Body mass index was calculated after noting weight and height of the patient.Venous blood (5 ml) sample was drawn and sent to the pathology laboratory of Nishtar Hospital Multan for estimation of serum LDL level and blood glucose level. Results: Of these 205 study cases, 92 (44.9%) patients were male while 113 (55.1%) patients were female. Mean age of patients in our setting was noted to 51.58 ± 8.05 years. In our study, 50 (24.4%) patients were smokers and 40 (19.5%) had history of hypertension. In our setting, family history of stroke was present in 39 (19%) and previous history of stroke was found in 31 (15.1%). Mean body mass index of our patients was calculated to be 23.17± 2.85 kg/m2and 30(14.6%) cases were obese in our study. Mean fasting blood glucose level was 118.32 ± 23.21 mg/dl(48 (23.4%) had diabetes). Mean low density lipoprotein level (LDL) noted in our study was 109.59 ± 49.15 mg/dl and raised level of LDL was seen in 88 (42.9%) of our study cases. Conclusion: By identifying the share of various risk factors contributing in ischemic stroke, we can target population at risk of ischemic stroke and strict control and regulation of modifiable risk factors we can prevent this ominous condition to occur. Our study results point towards early diagnosis which will ultimately lead to proper management to improve clinical outcome in such patients. Raised levels of LDL were significantly associated with gender, diabetes, hypertension, obesity, family history and previous history of stroke. Shahzad Alam Khan, Nishtar Medical University, Multan. Nasir Jamal Khan, Nishtar Medical University, Multan. Ikram Fareed Langrial, CPEIC Multan.